The Classic Rolled Style park bench features the same ribbed steel as our Classic Series, but also has rolled edges for a sleek look and feel. 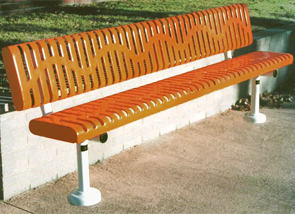 Its modern appearance takes an ordinary bench and makes it fun and interesting for all park visitors. The combination of its rolled edges, stylish design, and smooth finish makes this bench the perfect accent piece for parks and picnic areas. Benches come in 4', 6' or 8' length models; can be ordered in a portable, in-ground or surface mount; and optional grout covers can also be ordered with the in-ground and surface mounts to add to the visual appeal of this unique bench. 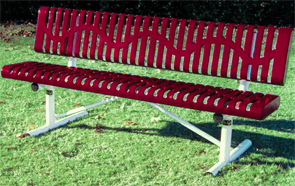 Available in a variety of colors, this innovative bench can complement nearly any environment. Bench frame is powder-coated while the back and seats are finished with a lightly textured Polyethylene finish. Ribbed Steel Seat & Back.